2018 WorldSBK Jerez Test Day Two Results—During the final track action of the 2018 season Jonathan Rea (KRT) went under the existing Jerez Superpole record of 1:38.960, setting a 1:38.713 best lap before stopping half an hour before the end of the tests. Rea scorched the field once again at Jerez. 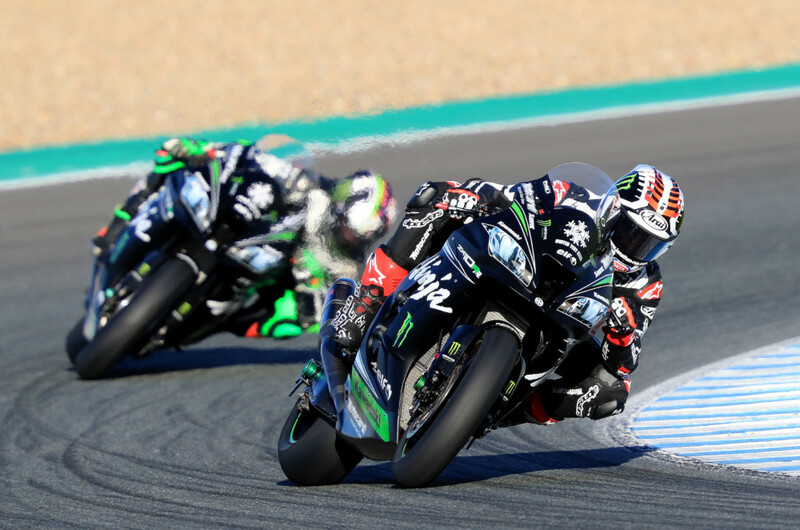 Rea used a Q tire to set his best time on Tuesday, at around 11 am under the best track conditions, albeit on a track surface that was breaking up in several spots. Alex Lowes (Pata Yamaha WorldSBK) pushed his way to second overall on day two, with a 1:39.377 best, but he was still 0.664 seconds from Rea, despite his strong showing on a Yamaha that featured the latest swingarm and other chassis developments. WorldSBK prodigal son Leon Haslam (KRT) improved his time late in the day to go third. His final one lap pace was also to be backed up by strong lap times on worn tires, according to his team. getting used to electronics, while not making very many bike changes at all, was the area of most improvement for Haslam, who set a massive 100 laps on the final day. Chaz Davies (Aruba.it Racing Ducati) placed fifth fastest as he awaits shoulder surgery to help his overall 2019 push on his all-new bike. Michael van der Mark (Pata Yamaha WorldSBK) was another to make a move late in the second day, to sixth place despite his recently diagnosed broken left scaphoid. Old hand in a new team Marco Melandri (GRT Yamaha) and new boy in the entire WorldSBK world, Sandro Cortese (GRT Yamaha), were the final two Superbike riders in the combined rankings. Next is a respectably long winter break, followed by two sets of tests in late January next year, at Jerez again and then Portimao, where the rest of the main 2019 teams should join those who were at Jerez this time around.